Ad -This is a sponsored conversation written by me on behalf of Pillsbury™. The opinions and text are all mine. 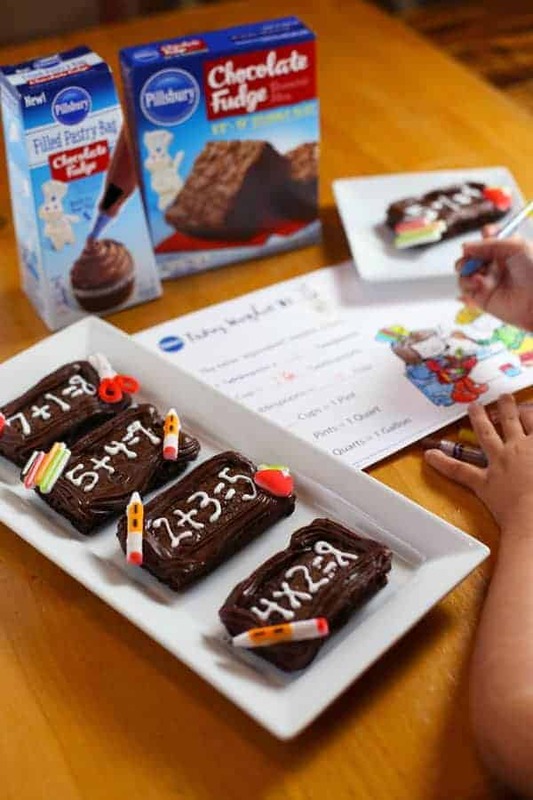 Chalk Board Brownies are made with Pillsbury™ Chocolate Fudge Brownie Mix and Pillsbury Pastry Bag Chocolate Fudge Frosting, plus math problems made of icing and school themed sugar toppers. 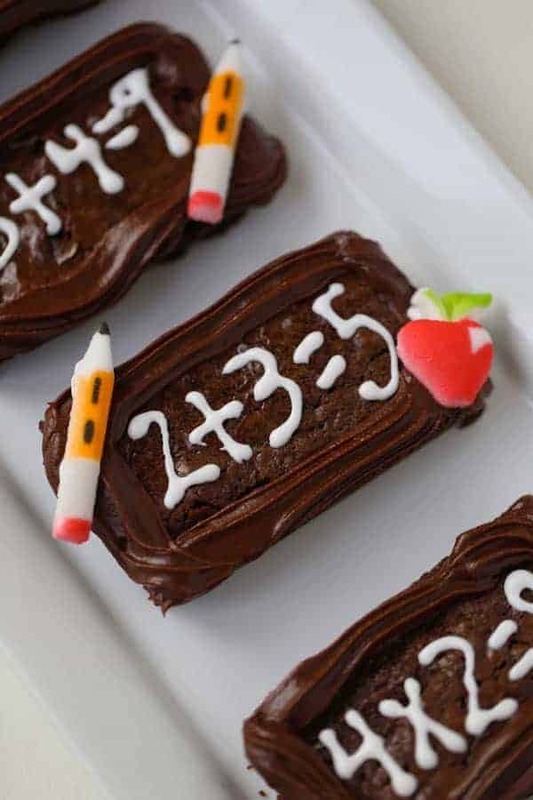 Aren’t these Chalk Board Brownies the cutest?! I made them for my special guest this week, my god-daughter Estelle. She’s visiting from Florida, so I wanted to do a fun project with her. She LOVES brownies. She’s also in the first grade and trying to learn her addition and subtraction tables. 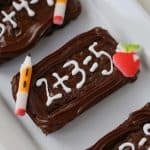 I thought, why not help her learn math with a favorite treat. 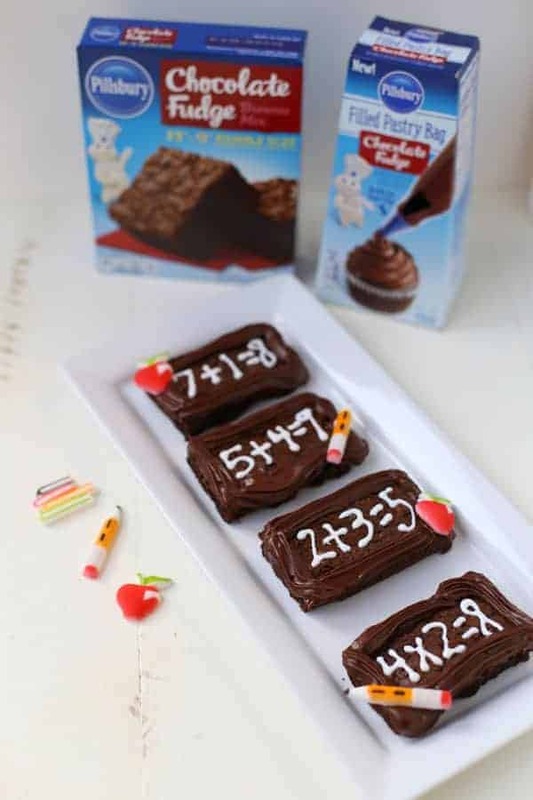 What better way to learn math than with brownies! That’s what I say! And because we wanted to focus on the math, it was so much easier to use a box mix. 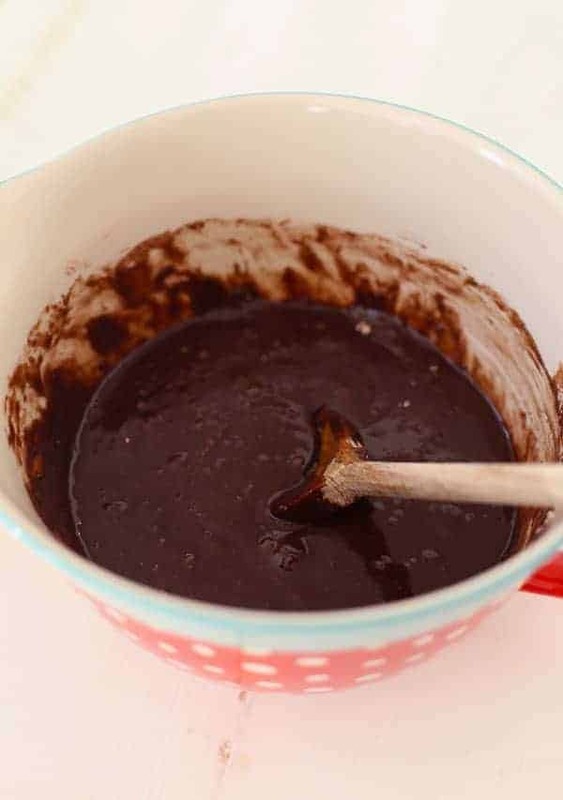 The Pillsbury Fudge Brownie Mix is one of our favorites! Then we used the pre-filled Pillsbury pastry bag to pipe the chocolate frosting border of our edible mini “chalk boards.” I love how effortless it is to just open the box and have my pastry bag already filled with frosting and ready to use. 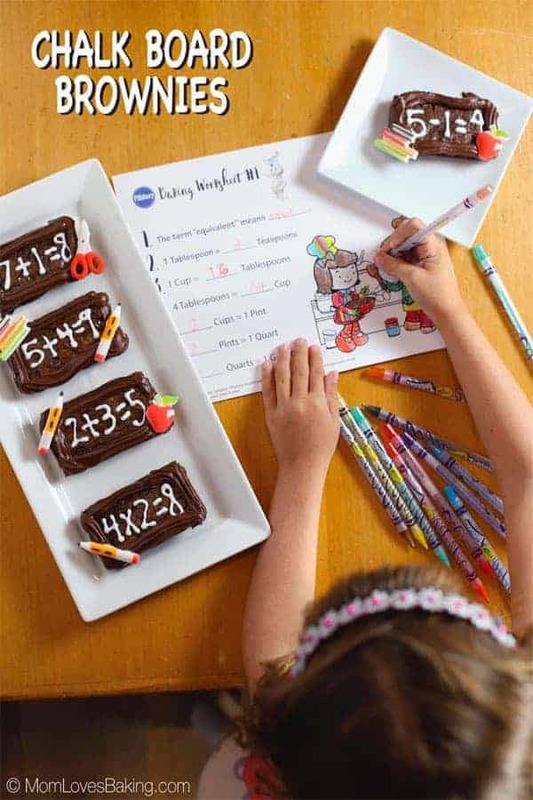 Estelle and I had so much fun celebrating math and the new school year with Pillsbury Brownies. I’ve actually joined forces with Pillsbury to help spread the word about Operation Celebration. I love that name. Isn’t it cute?! And honestly, I think it’s very appropriate because I take celebrating very seriously! So what is Operation Celebration, you might ask? It’s a way of inspiring families to get together in the kitchen and celebrate special days with sweet treats. That’s right up my alley. I’m all in for Operation Celebration! Pillsbury and the Pillsbury Doughboy want to inspire YOU to join Operation Celebration. Click here to sign up for the Pillsbury Operation Celebration Newsletter to receive baking ideas. 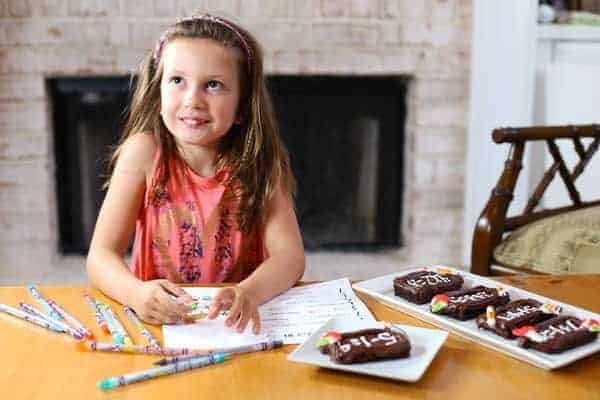 Making our Chalk Board Brownies is as simple as ABC. You just whip them up in one bowl. And you don’t even have to use a mixer. Just stir them with a spoon. 50 strokes, of course. I used a 13″x9″ baking pan sprayed with cooking spray. Poured the batter in the prepared pan, spread it evenly and baked at 350°F for about 30 minutes. I let the brownies cool, then piped the math problems on top. Then we made the chocolate frosting border. Estelle helped me. The New Pillsbury Filled Pastry Bag made frosting our brownies a cinch with a ready to go pastry bag already fitted with a pastry tip. We used the chocolate flavor but it’s also available in Vanilla and Cream Cheese flavors too. Here’s Estelle, figuring out a math equation. I also helped her learn some baking measurements like how many tablespoons are in a cup and how many pints in a quart. Pillsbury provided us with some super cool worksheets which Estelle enjoyed coloring as well. 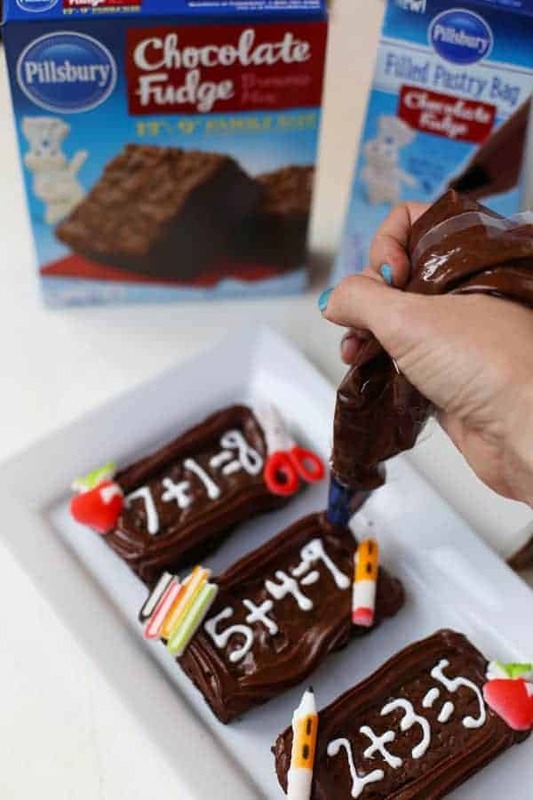 We had such a great time baking and learning math together with these Chalk Board Brownies! Then we rewarded ourselves for all the effort we put into learning by eating our math problems! Ha! That sounds funny. But Estelle was totally serious when she took a bite and said, “these are so yummy and I love them so much!” And of course we shared our homework with the rest of the family. Preheat oven to 350°F. Spray a 13"x9" baking pan with non-stick cooking spray. Set aside. Prepare brownie mix according to package instructions. Pour into prepared pan. 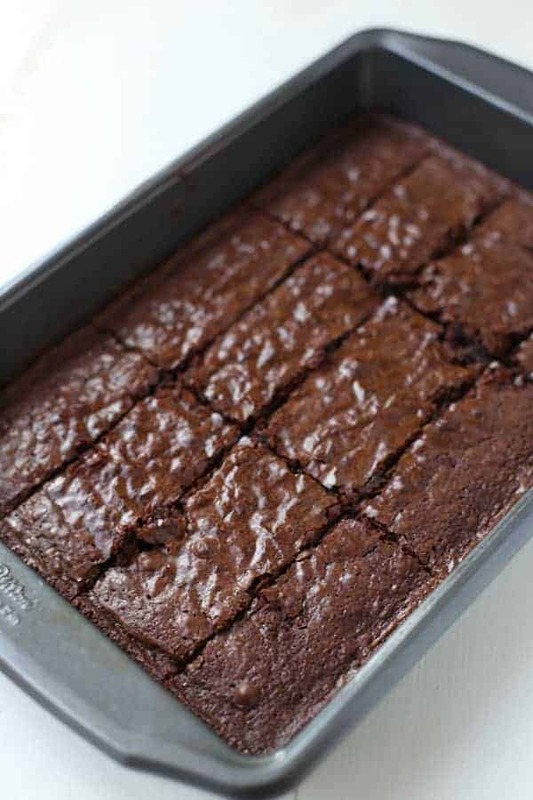 Bake for 28-31 minutes. Let cool. Cut into 12 rectangles. Pipe math problems with white icing. 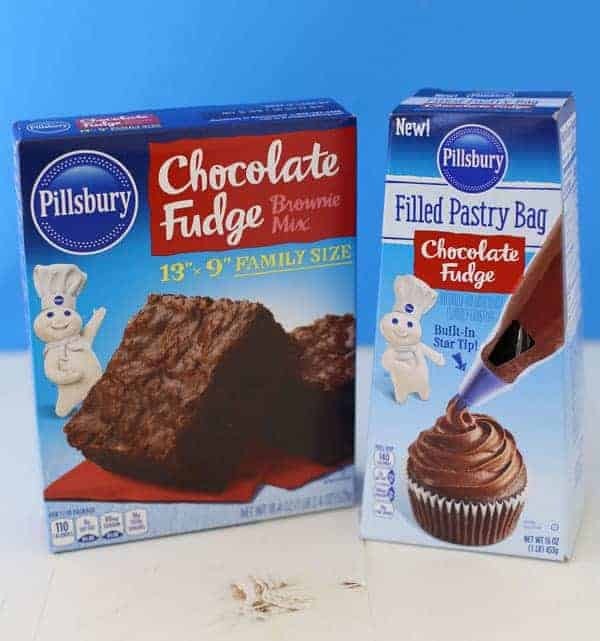 Then pipe a border with the Pillsbury Pastry Bag Chocolate Fudge Frosting. Top with school-themed sugar toppers or sprinkles. Serve immediately or store covered for up to 3 days. 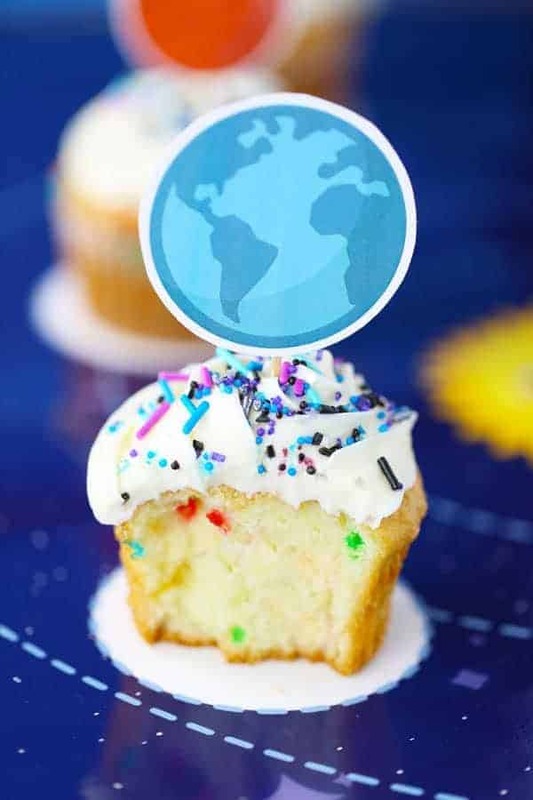 Check out our fun Solar System Cupcakes made with Pillsbury.